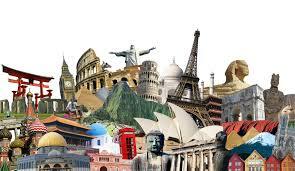 Jamison of Points Summary recently posted Why I’m Still Avoiding Travel to Western European Countries where he explains his main reason for disliking travel to Western European countries. By Western European, I am assuming that he is talking about the UK, France, Austria, and anything else pretty much east of Germany. So, in his post, Jamison writes that the reason he chooses to avoid traveling to these countries is simply because he finds the cost of eating and drinking in Europe a little too much for his wallet. Yet his major complaints seem to involve seeking out American food products and chains in European countries. He chooses to visit Starbucks rather than a local coffee shop or cafe. He insists on buying American soft drinks rather than seeking local alternatives. Personally I believe that eating in Europe can be as affordable (or as expensive) as you allow it to be. There are definitely more possibilities for eating than seeking out the familiarity of a Starbucks sign and American junk food. First of all, when traveling it is most important to concentrate on breakfast. If you happen to be staying at a hotel where breakfast is included, be sure to have a hearty one! And grabbing a piece of fruit or a pastry to go is probably a smart idea too! 1. Sandwich Shops and Bakeries – These definitely are my number one go to places when I am traveling abroad. 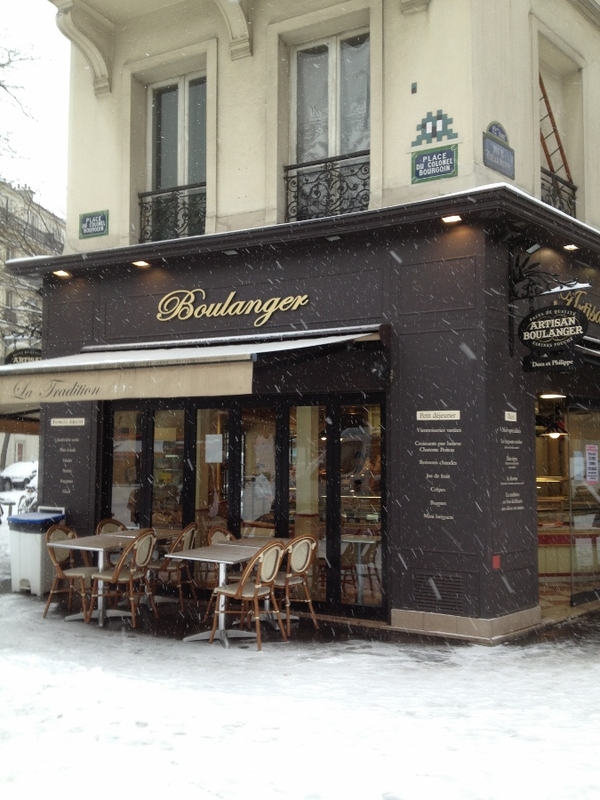 There is nothing quite like a fresh sandwich on crusty European bread or a warm pain au chocolat. I like that you can eat on the go or take the time to sit at an outside table if you wish. In France, at a small eaterie like Pret a Manger, these little delights usually cost between €2-4. In the UK there are bakeries everywhere that serve everything from sweets to savory sausage rolls and meat pies. Many small cafes and bakeries also make exceptional coffees. 2. Street Food – Every country has its own take on food trucks – like the ones that are peppering the streets across the United States. And like their counterparts here, they serve everything you can imagine. In most major cities there are French creperies, Turkish kebab stands, German currywurst shops, Italian pizza shops, and Belgian moules et frites(mussels and fries) vendors – and they are everywhere especially in and around train stations. (Since we are talking Europe here, I won’t even bother to mention the incredible street food to be found in Asia!). 3. Markets – I absolutely love to visit local markets when I travel. There is just something exciting about prowling the aisles and studying the food preferences in other countries. 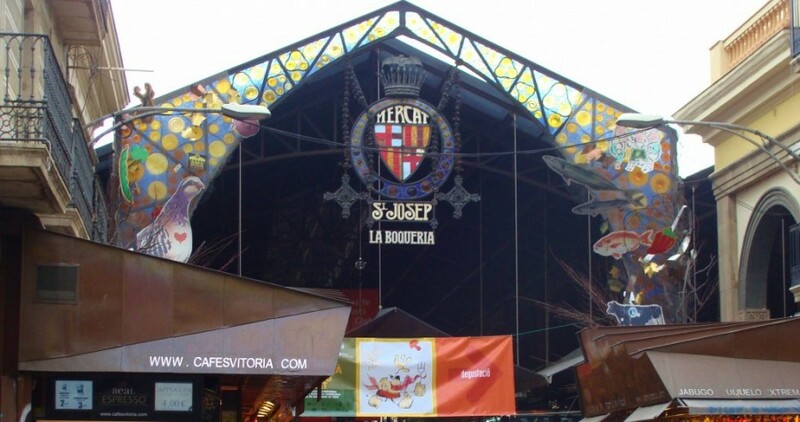 In Barcelona, I ate many a meal at the Mercat de Sant Josep de la Boqueria located on Las Ramblas – everything from sandwiches to full sitdown seafood dinners – all at a fraction of the price of a restaurant meal. Seldom do we visit the North of England without a visit to the Bolton Market to sample the fares at over a half-dozen bakeries featuring Lancashire baking. Markets are a great place to find fresh fruits and fruit juices freshly baked breads, local cheeses, and meats. 4. Restaurants – Yes, it is definitely okay to splash out and have a meal at a restaurant but when you decide to do so, take to the side streets and walk around and away from the high-traffic tourist areas. Search for small local restaurants. 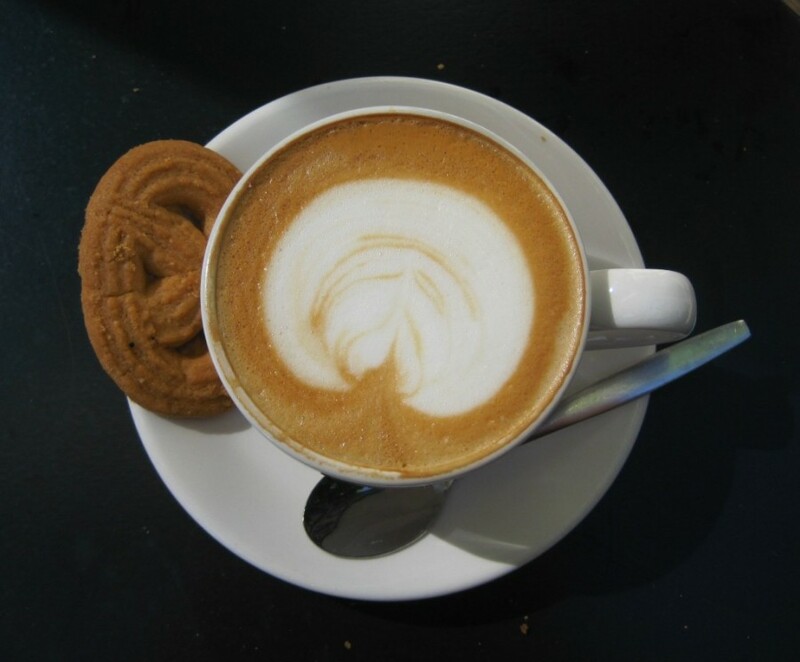 If you are unsure of what to order, you can ask if they have a set menu – a prix fixe, menú del día, or prezzo fisso. You will end up with a multi-course meal that doesn’t cost very much (perhaps around €10-20). 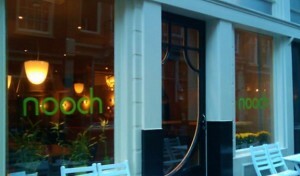 That’s exactly how I found my favorite little restaurant in Amsterdam – Nooch. And don’t forget, if you are in the UK, pub food is not a bad alternative at all! 5. Eating Outdoors – Have a picnic! Using a combination of places above, it is quite easy to throw together a picnic of bread, cheeses, meats, and even a bottle of wine. What better way to spend a beautiful day than having a picnic in a local outdoor park! 6. Water – You may think that ordering water while dining in a restaurant can save you some money – and it can, as long as you specify ‘tap’ water. In Germany, you would ask for Leitungswasser; in France l’eau du robinet; in Italy, acqua del rubinetto; and in Spain, agua del grifo. Make sure that the waiter understands you or you may find yourself drinking a €5-8 bottle of ‘mineral water’. Most bottled water will cost you around €1-2 on the street. But if you keep your bottle or carry one of those collapsible ones, many cities have public drinking fountains where you can refill easily (yes, it is quite safe to drink). 7. When all else fails – Ask the locals or even the Concierge at your hotel. I have no qualms whatsoever about asking the Concierge where to find an inexpensive, local dining place. The key is emphasizing the word ‘inexpensive’. It was the Concierge at the Intercontinental in Vienna who steered me to Bettelstudent, a small, local restaurant just a short walk from the hotel where I dined on a delicious Wienerscnitzel at a very affordable price. So, for Jamison, I would hope that he won’t give up on visiting Western European countries just yet simply because he feels the dining options are pricey. If you just can’t help yourself, yes, you can actually visit a McDonald’s, Burger King or even Kentucky Fried Chicken if you feel like you just must have something a little more familiar. However, I can honestly say that in the 25 years that I have traveled to Europe, I can admit to having eaten at a McDonald’s only twice – and one of those times was simply to try a Lamb-burger. There are loads of affordable eats out there, Jamison! Get out and explore! 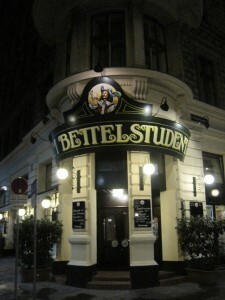 Do you have any favorite tips for eating out while traveling in Europe? 14 Comments on "7 Tips for Eating Affordably in Europe"
There’s a whole lot of Europe between Russia and the Atlantic Ocean which is not Western Europe. Generally speaking Germany, Austria and Italy are considered the eastern edge of Western Europe. Many will put Greece in the west as well, though Poland, the Baltics, Ukraine, Belarus, Slovakia and many more are decidedly not. As for the dining options, I tend to find doner shops at or near train stations to be filling, tasty and cheap. And a local grocery goes a long way. Absolutely! Thank goodness for the Grand Club in Istanbul during the riots there! A true haven….and a great food selection! Spain and Portugal are most certainly western Europe but because of current economics, dining in the middle of a tourist zone is still comparatively inexpensive versus dining in London or central Paris. The food will possibly be a little lower quality though. At any rate, in most cases venture out of city center. 3 to 5 metro stops is all you need and with internet to find these gems it’s easy. Though I also concur with the market. Whether you make a simple picnic meal or if you have an AirBNB or other short term flat with a small kitchen, making food with local ingredients is fun too. That’s why I seek out pub food in London….and street food or very small cafes in Paris. And thanks for your tips as well….public transport and a little research help a lot in finding the special spots! In Turkey, we got invited for lunch by the shopkeeper in Antalya, simply for making small talk …..free lunch is always nice. Yes – it is those kinds of gestures that make travel so interesting! Very good points. I had to chuckle when I first read Points Summary’s post. I can’t imagine staying away from Western Europe based on those reasons since there are so many ways to keep your costs in check. I know….right? It’s all about choices! What’s that gurgling, aughhhh-like sound that Homer Simpson makes about bacon, etc? So, two years ago I travel Egypt (1 week), Kenya (2 weeks), Tanzania (2 weeks), India (4 weeks) and then to Vienna. Guess where I got a case of food poisoning? Yep, der Wienerscnitzel in Vienna got me. Can’t look at Wienerscnitzel the same ever again…..
Oh no! That would definitely be off putting! Luckily mine was quite good! The only time I ever ended up getting a stomach thing was in the Caymans. Still not sure what the source was! Do your ealize the only thing French about Pret a Manger is the name? And that it’s a huge UK chain with outlets all over the world? And that the US stores were backed by McDonald’s until they sold their interest to Bridgepoint. If you need a chain sandwich shop in France (and you don’t) try Paul. Yes – I do know that it is a UK chain and had my first experience with it in Oxford while attending school there back in the 80’s. However, it is also found in France… and if one is familiar with the name, it is relatively easy to spot. I would certainly tend to visit a local corner sandwich shop in Paris before I would stop in a Pret. So, because it is an easily recognizable name, I chose to include it in this piece.